I first read him in a bookstore when I was 19.
before my hell had even began. 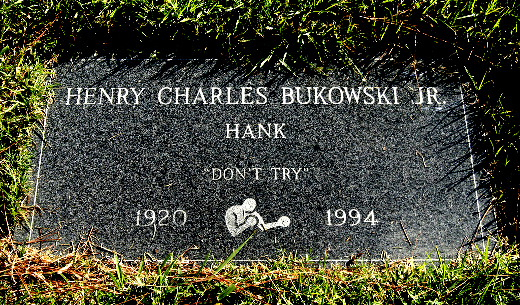 Henry Charles Bukowski humanized poetry. The stoicism of his anti-heroes perhaps betrayed a respect by many writers of the 20th Century for Ernest Hemingway. They called Hemingway Papa. Hemingway is not my Papa. In plain-spoken, dispassionate prose, Bukowski included the sometimes gross and hairy minutiae of life to arrive at a greater truth. He was not resigned to this-sometimes there is no greater truth. Some nights there is no peace.My Papa helped me through many war-like years and he still helps me, when I must ruefully look back on those years and try and find some peace with it all. Giving up is easy, the fight is painful. Losing the game is painful, until you find your own game and are eternally Victorious.He wanted to “frame the agony” and get in touch with magic, the miracle. He had more to say at the street level because that’s where he lived and spent most of his time. What is so important culturally about Bukowski is that, for all intents and purposes, he was part of the Beat Generation. The difference is he had to hold a job throughout America’s boom&twilight. He had no aunt with a house in New Jersey where he could sober up and dream of America. He watched the new school from out in the yard with all the other hopeless scabs. He watched them come and go and he outlived them all. Life went on for Papa. It always did. He had to contend with elements unleashed after the dark curtain of a right-wing backlash fell in the 80s. And for all intents and purposes, we are only living in the post-80s. He found courage, acceptance, defeat and ultimate glory in the mastering of his own game. The poetry coming from Papa during the August years of his life in San Pedro is some of the most indelible ever written. It smacks of one of his heroes, Li Po, with its all-inclusive sentimentality and the beautiful realities uncovered once grand notions of entitlement&romance are stripped&thrown away. It coudn’t be taken away from him in his early years either, even if he didn’t know it, while under the spell of his “assault”; bad cases of the blues he wrote about so unflinchingly. Underneath all his armor was something his father couldn’t take away with a razor strop. So that, years later, when looking back at a “decade of 12 hour nights”, he was suddenly touched by magic and left the job for good. I’ll give Hemingway cred for the emotional subtext of Bukowski’s man’s man, but as it turns out, his writing owes allot more to Raymond Chandler. It’s fitting that his last novel was a detective one, and his protagonist hired to find Lady Death. Many lived like Papa but did not become a celebrated writer/poet/movie writer. Many just died in madness with their women or in a gutter all alone.Throughout his literary output and life, Papa knew what those eastern mystics&Taoists were saying. He moved about a destitute metropolis of 80s America, admiring cats and simple distractions like the race track&the mockingbird. But through it all he knew succinctly what another great Taoist writer, Lao Tsu, knew:little fears eat away at man’s peace of heart. Great fears swallow him whole. Make your best peace with things, a deal, because the game is rigged. The real action, the best game, is inside. Be alive with the gamble, be touched by magic but don’t get so wrapped up in trying to beat the game. Be like Papa and lose everything. Lose it all, you don’t need it. It’s a rigged game and a burden. When you put down the burden of who even YOU think you’re supposed to be, you can just be who you are. Thanks for the courage, Papa.